Happy Birthday Dr. Seuss! 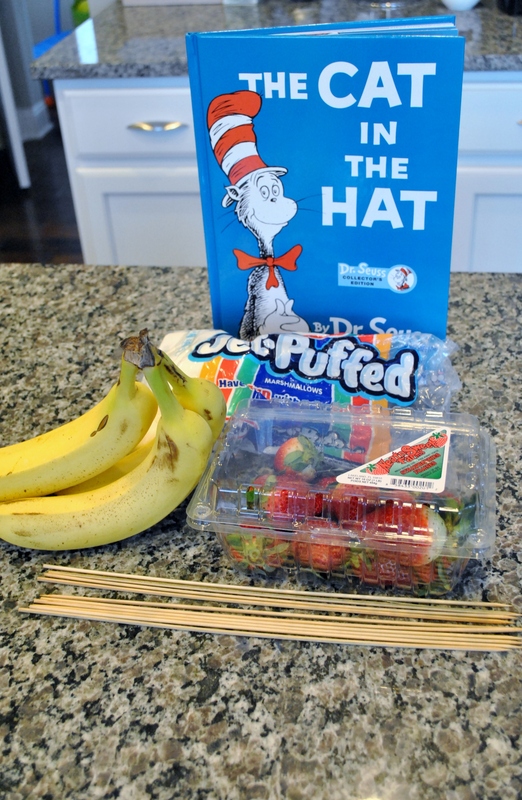 On March 2, people across the country come together to celebrate “Read Across America Day” in honor of Dr. Seuss. This is a day to not only recognize one of our most amazing authors, but also a great opportunity to for teachers, students, parents and children to come together to read and take part in literacy related activities. I always loved celebrating this day with my students when I was teaching, and now it is a day I look forward to enjoying with my own kiddos as a stay at home mom. 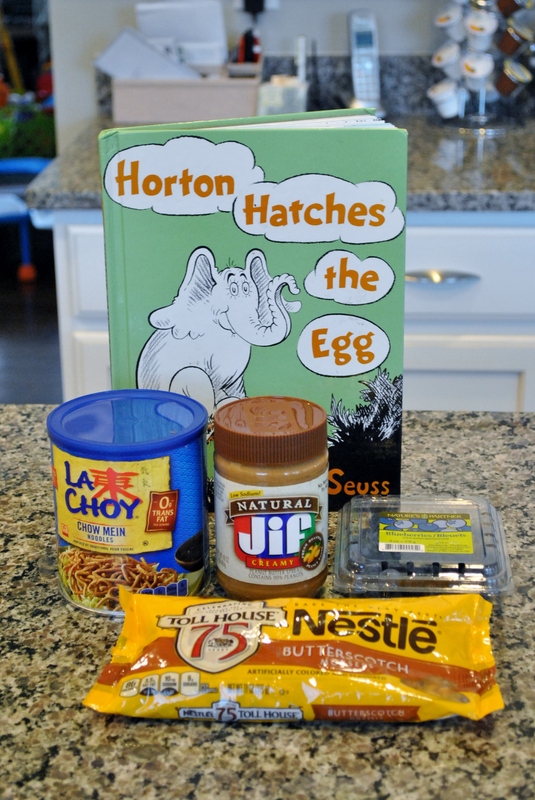 This year Dr. Seuss’s birthday falls on a Monday, so we made some tasty treats for “Kids Cook Monday” to go along with some of our favorite Dr. Seuss books. We started by reading the most classic Dr. Seuss book, The Cat in the Hat. It’s funny. It’s silly. And, it’s always a crowd pleaser. 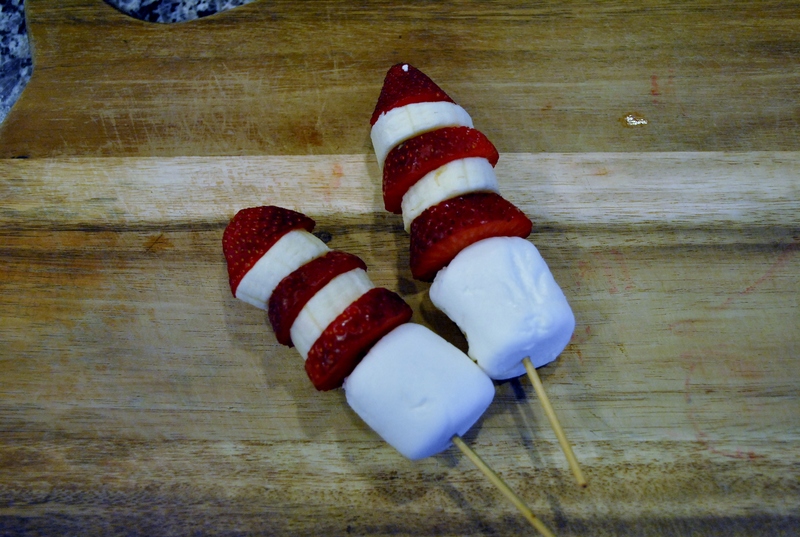 We made some easy little fruit kabobs to go along with our lunch and story. 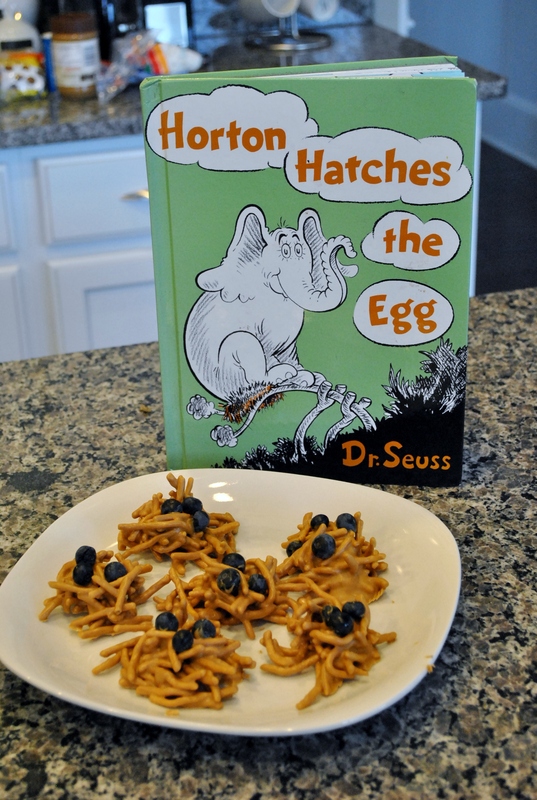 Then we read my favorite Dr. Seuss book, Horton Hatches the Egg. It’s the sweetest story about an elephant who promises to take care of an egg and goes through terrible circumstances but never leaves the egg. I just adore Horton’s selflessness and love. I always loved reading this book to my first graders and will never forget reading it to my Brady when he was just a tiny baby. Seriously, my favorite. 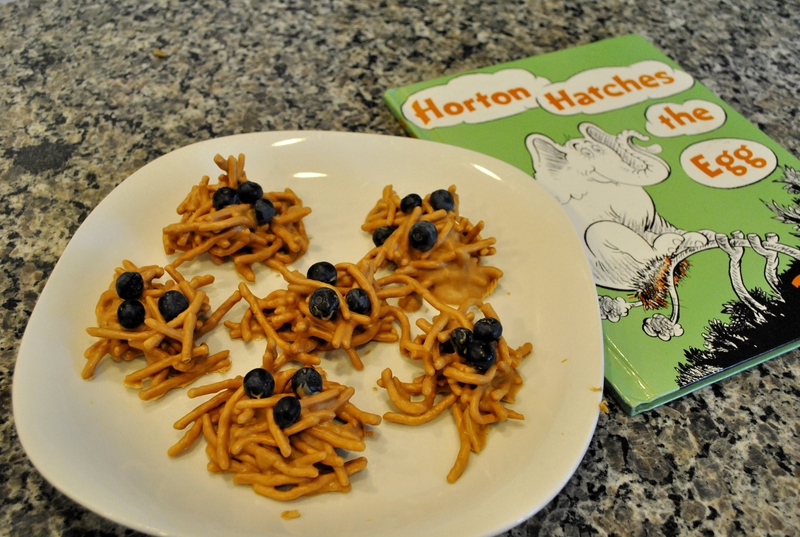 We made these cute little haystacks that look like a bird’s nest with blueberries to represent the egg that Horton was protecting. 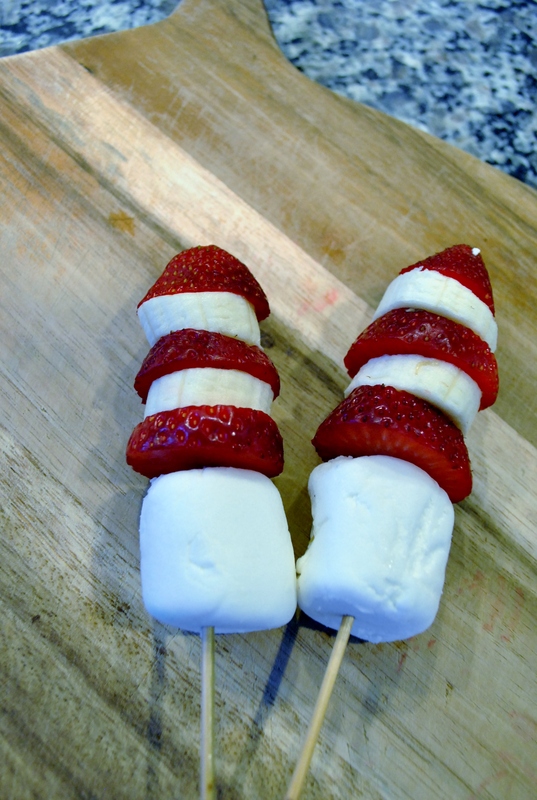 These are the easiest and tastiest treats. Stir the mixture until smooth. Add the chow Mein noodles. 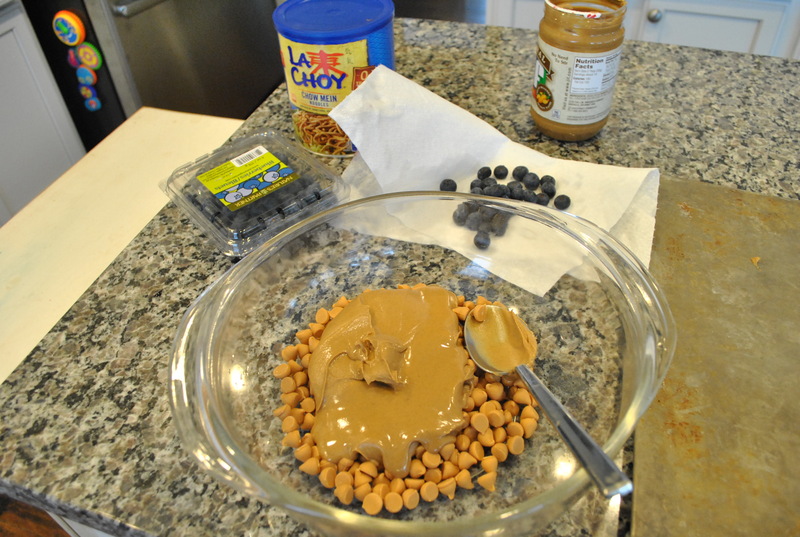 Stir until all the chow mein is coated with the peanut butter mixture. 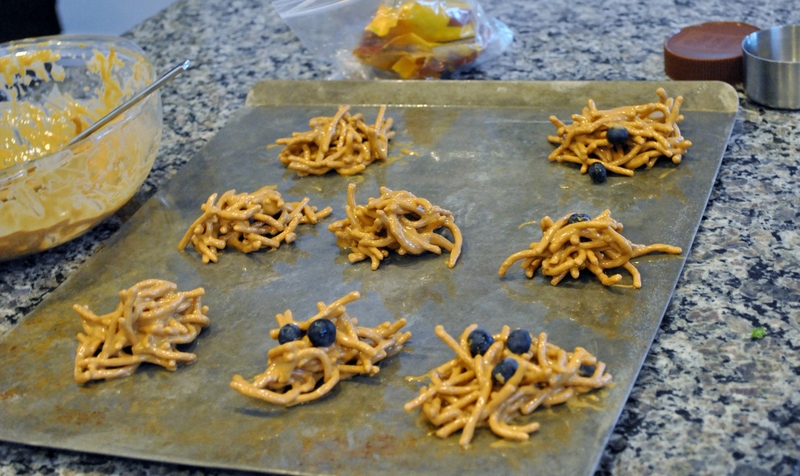 Scoop spoonfuls of the chow mein mixture onto a greased cookie sheet. 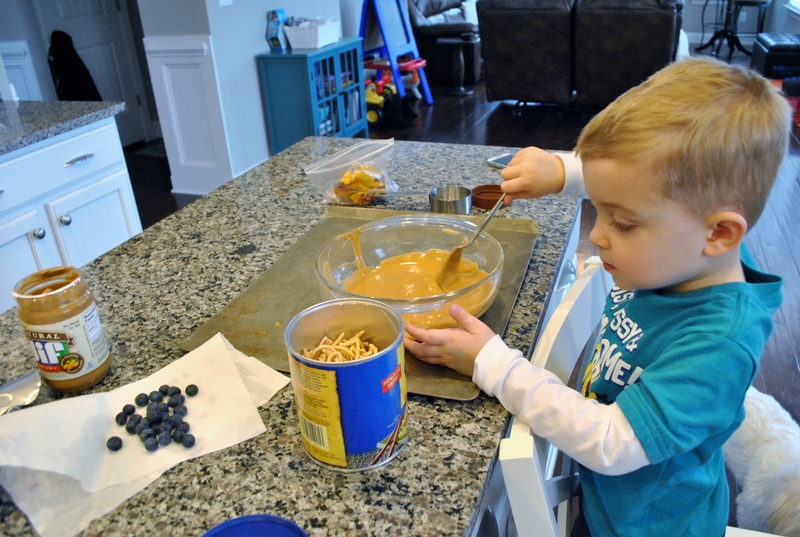 Add blueberries to the tops and put into the refrigerator for at least a half hour. 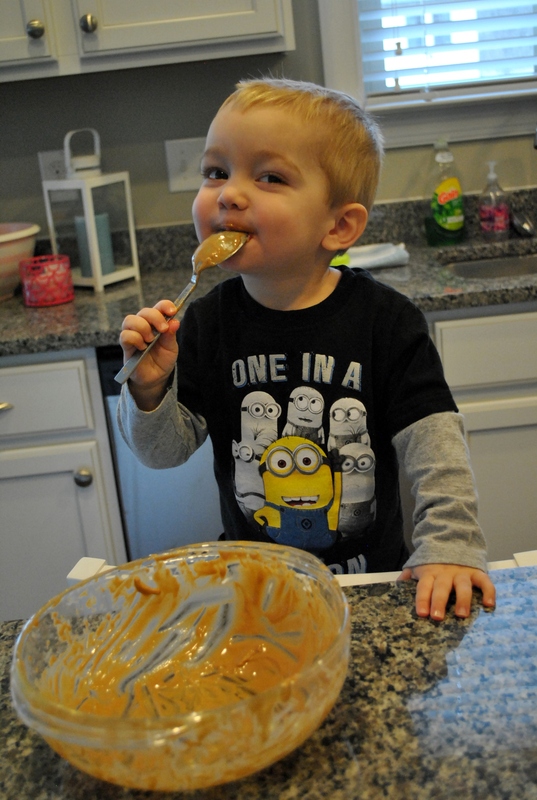 While the nests are cooling and hardening in the fridge, let your littlest helper lick the bowl. 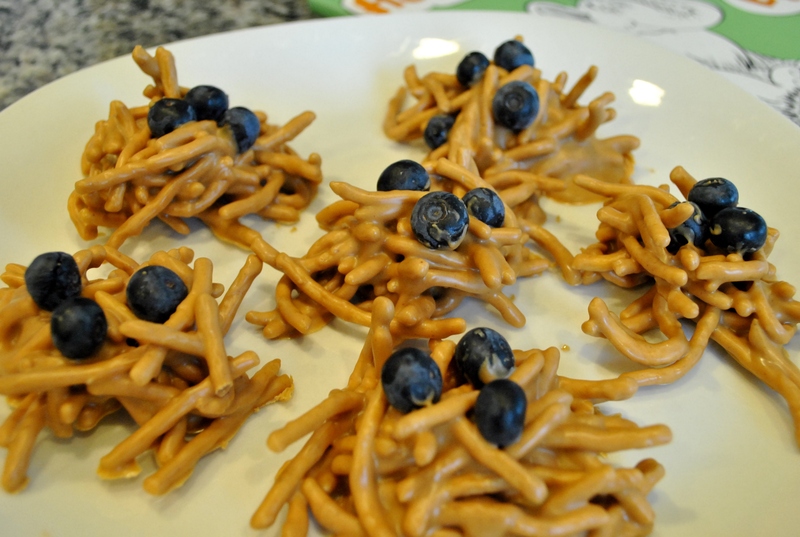 These little guys are sweet, salty, crunchy and the blueberries are surprisingly necessary! If you don’t have many Dr. Seuss books at your house, or you can’t make it to the library to check some out, look on Youtube for some awesome readings of some of his most popular books. This is one of my favorites too! 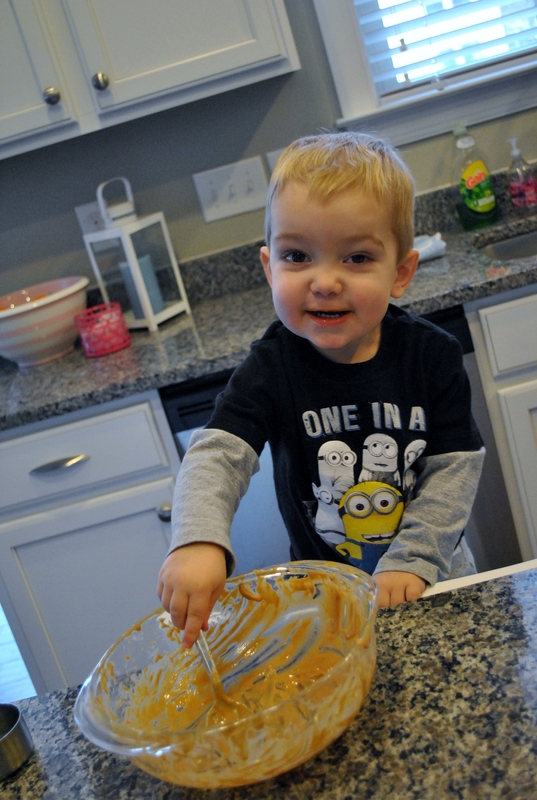 Hope you and your little one get to spend some time in the kitchen and with a great Dr. Seuss book! If you would like any more information about “Read Across America Day” or ideas for celebrating Dr. Seuss, check out this website! Ah, Winter time. That lovely time of year where noses never stop running, feet never seem warm enough, and cabin fever sets in. 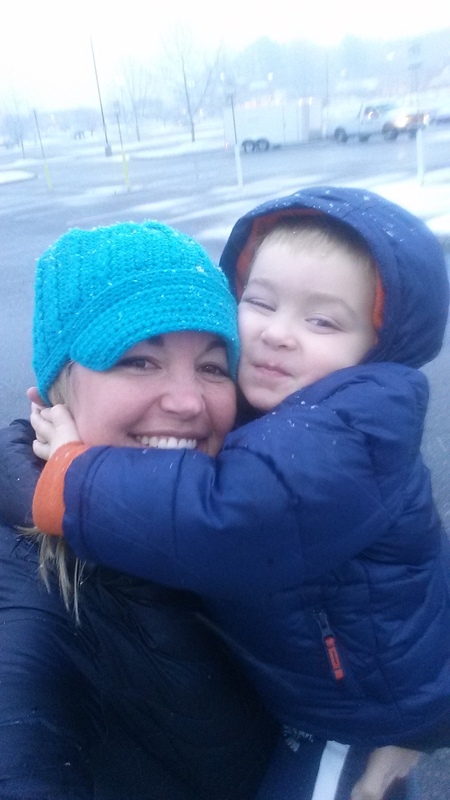 Admittedly, this North Carolina winter has paled in comparison to what went down last winter in Pennsylvania, but when you’re a mom of two small kids, cold is cold. No outside playtime and always having to bundle up to go anywhere is a drag. Then when you add snow or ice that keeps you housebound, well, that’s a lot of togetherness! 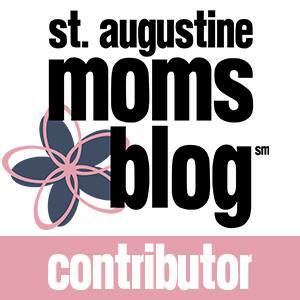 So, I’m sharing what we do to keep sane in Winter months. First of all, without a doubt, there is more T.V. 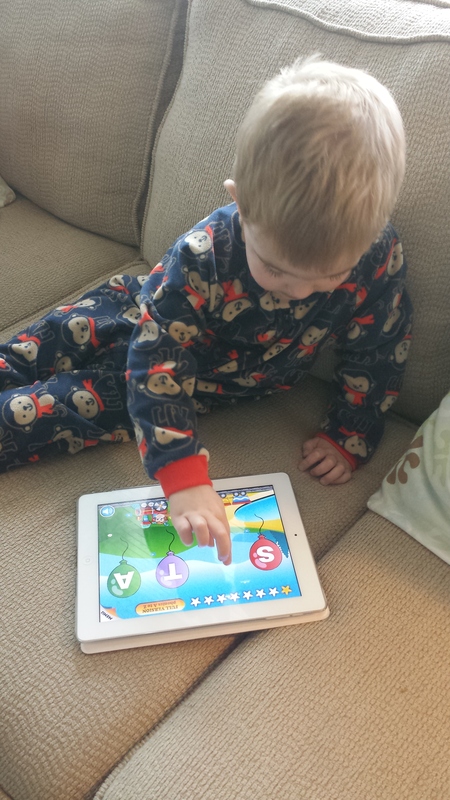 watching and iPad time. I just don’t know how to completely avoid that. We have literally played with every.single.toy. in our house. 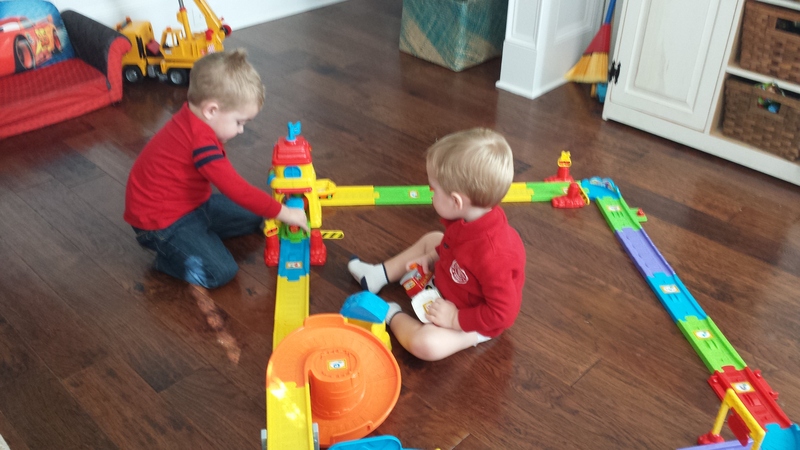 We build and take apart various train tracks all day long. We paint pictures. 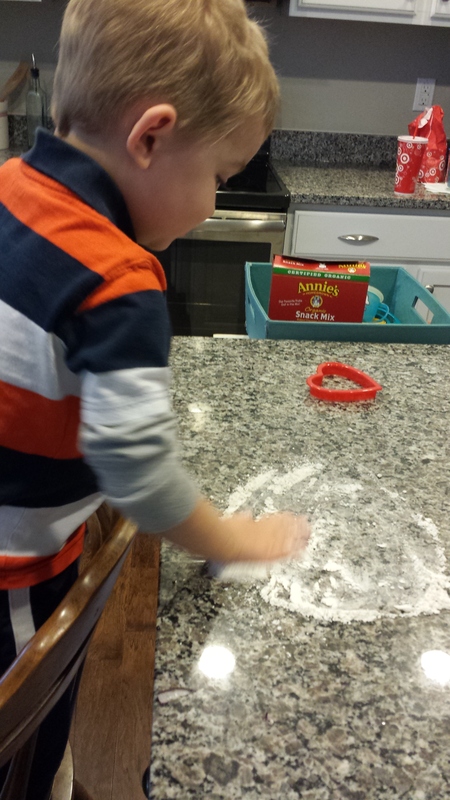 We play with Play-doh. We read and re-read our favorite books. We do puzzles. We make buildings with Legos and blocks. We have races around the house. We jump on our trampoline. Aaand, that gets us to right around lunch time. Whew! 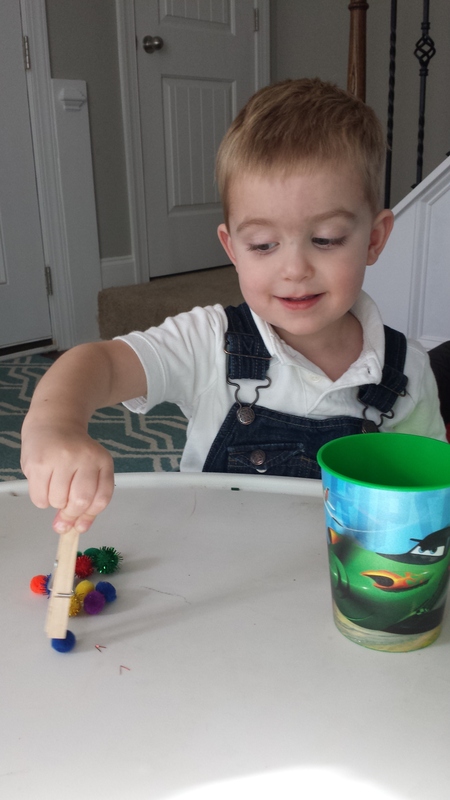 Working on those fine motor skills! 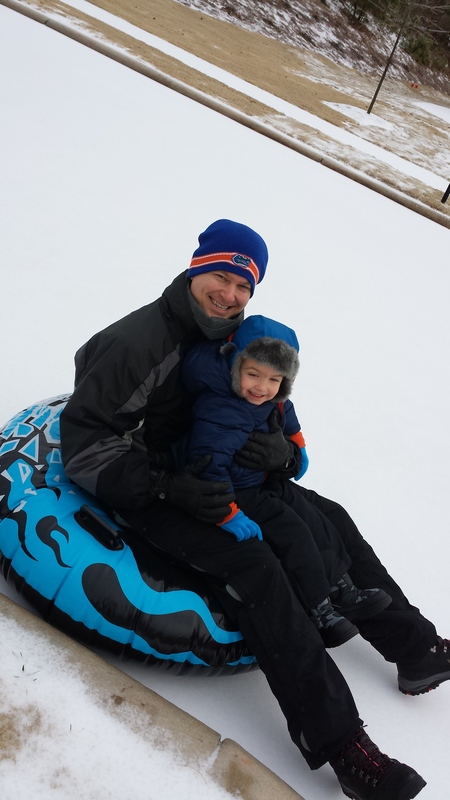 The real winter fun begins when we can get out and play in some cold weather. Last week we had this weird ice/snow storm that froze everything, made roads impossible to drive on, and canceled school all week. Thankfully we were stocked with lots of food and Chris was home with us as his travel plans were canceled for the week because of the weather. 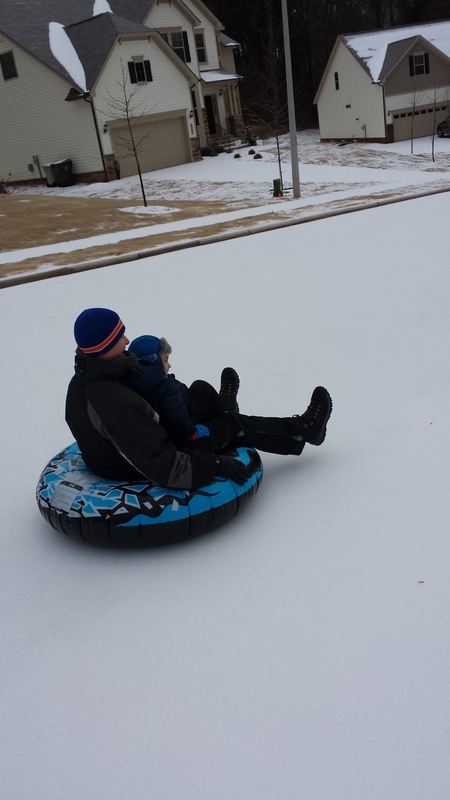 We couldn’t go anywhere, so we just used that time to bundle up and play on the ice. 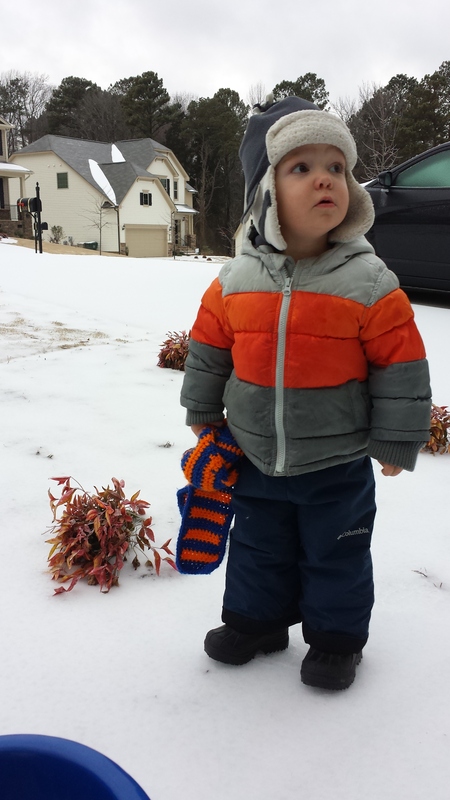 Nolan kept saying “Pretty Snow. Wow.” but he only kinda tolerated being outside in the cold. 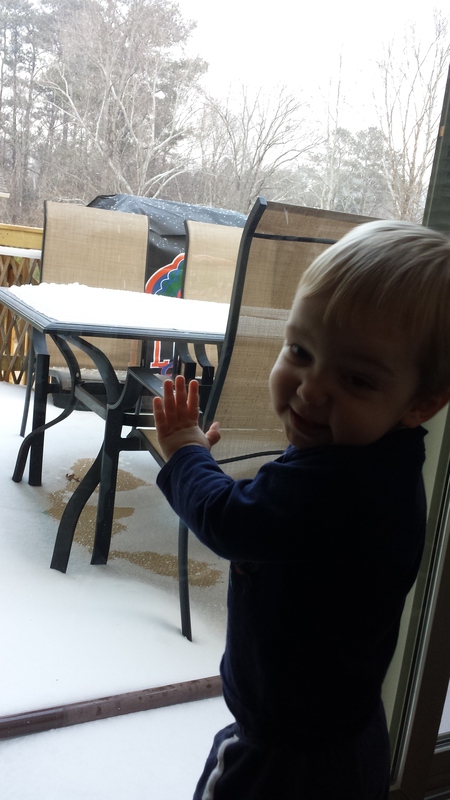 He refused to wear gloves and was much more interested in coming inside the warm house to eat breakfast. 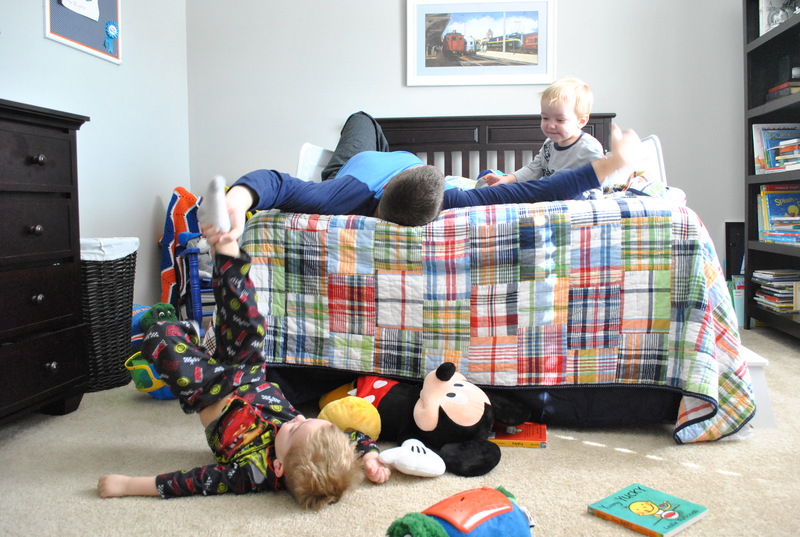 While North Carolina does have it’s share of warmer winter days where temperatures reach into the 50’s, for the most part it’s much chillier this time of year and you are forced to find inside activities to fill the day. Some of our go-to places to venture to are the mall play area (if I’m up for dousing the kids with hand sanitizer afterwards), the train table in the children’s section of Barnes-n-Noble, a friend’s house for a playdate, the Chick-fil-a play area (so mommy can get an iced tea and a moment of sanity), story time at the library, Marbles Kids Museum (definitely getting our money’s worth out of those annual passes!) and the North Carolina Science Museum. 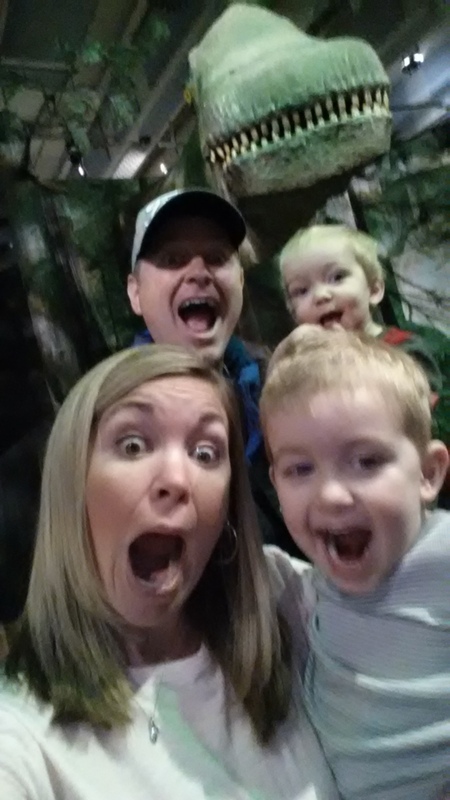 At the “World’s Largest Dinosaurs” exhibit at the Science Museum. 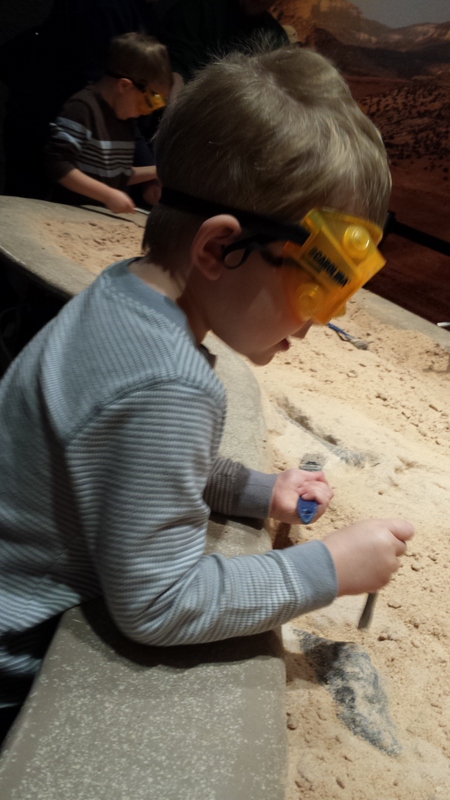 Dino dig at the Science Museum. 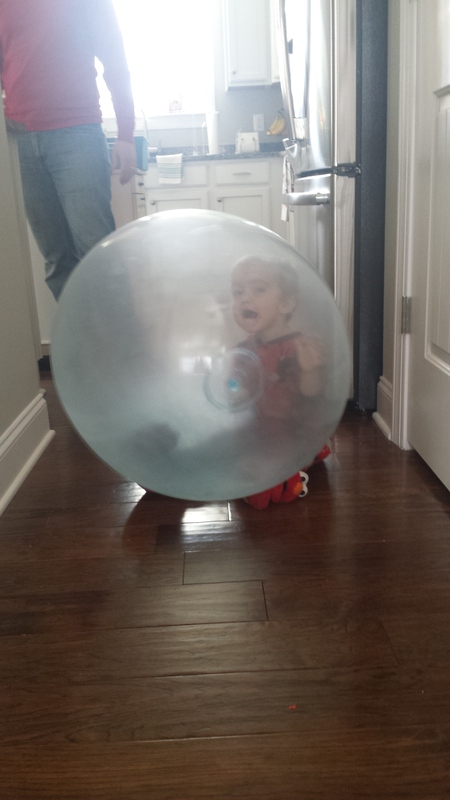 Brady was in heaven. When all else fails and we just can’t think of anything else to do, we make music, play music, and dance. Another winter pastime of ours is finding a house project/re-decorating. It must be all that time spent sitting around the house that makes me start to critique every piece of furniture, paint color or throw pillow. 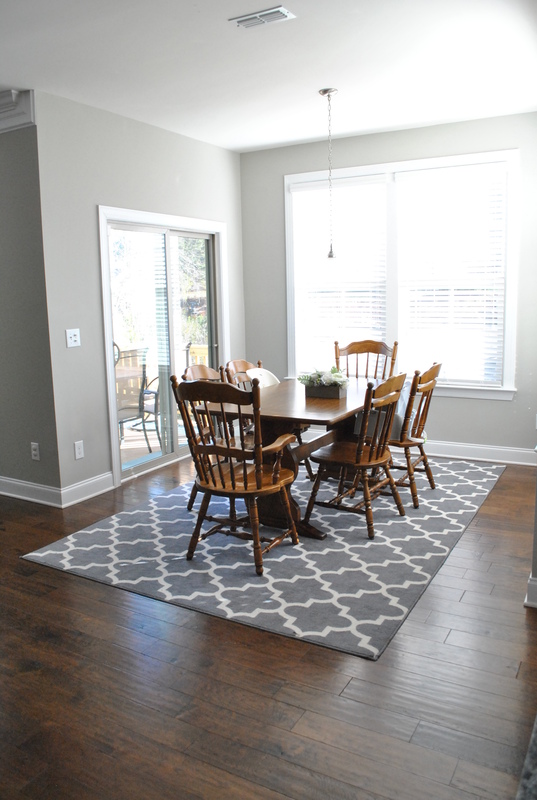 Our house is new, so theoretically I shouldn’t have that much I’d want to change, but my dining room table has been on my mind for sometime now. 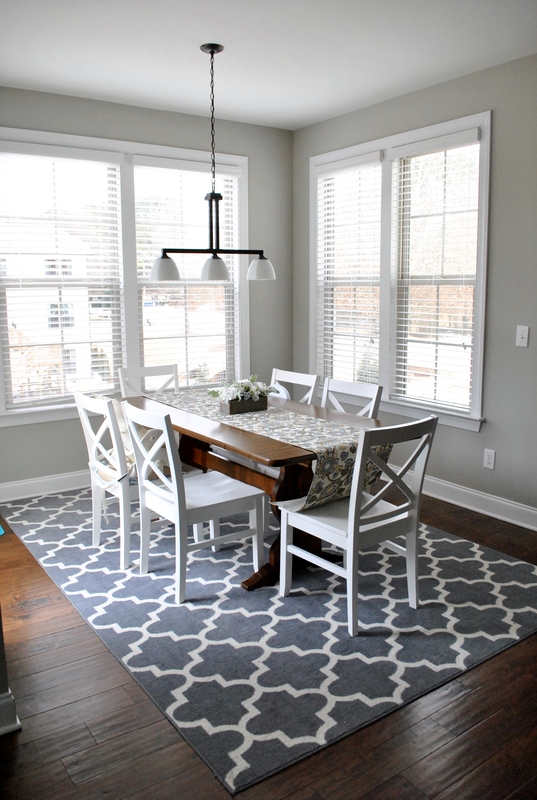 I’ve always loved the table as it used to belong to my grandparents, but the chairs were not my style. During our week of being stuck inside, I finally bit the bullet and ordered some new chairs. 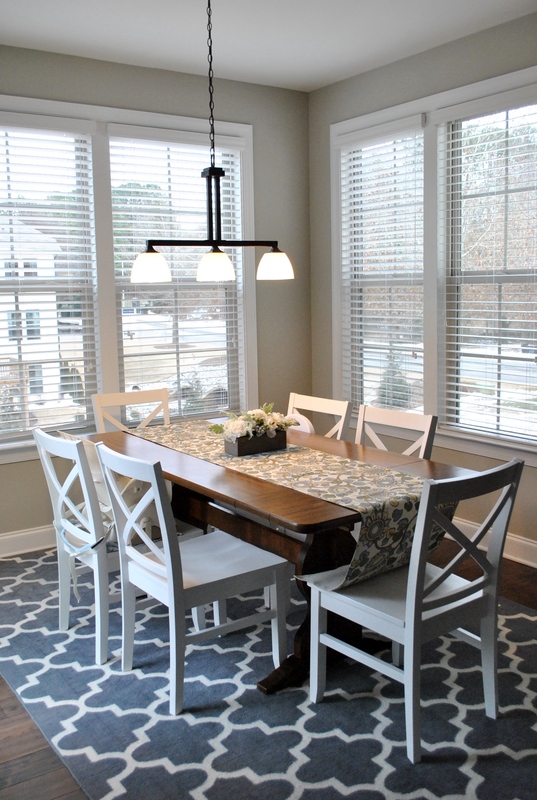 Then, our first outing after the ice storm was to Home Depot for a new light fixture for the dining room. Thanks to winter storms, my hubby was in town all week and had some time in the evenings to put this all together for me! I’m a much bigger fan of the “After” look. 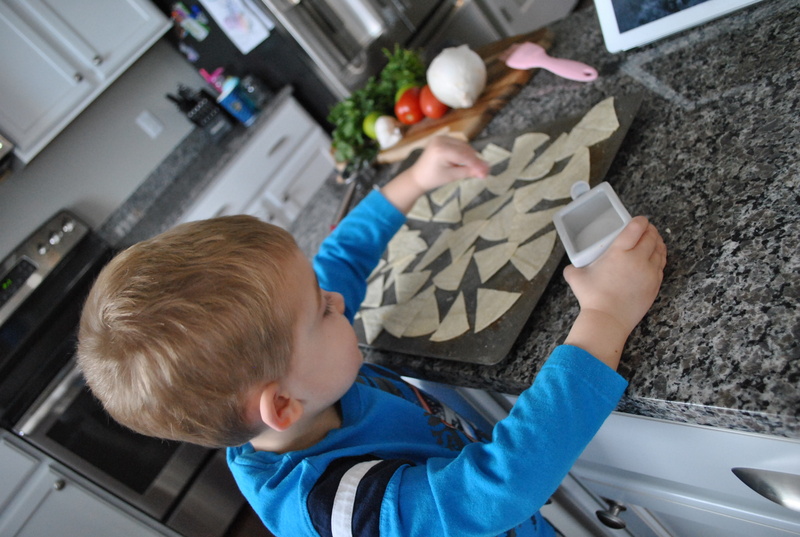 We try to make the most of our time together during all the cold weather, cabin fever loveliness, but some days seem to turn into a blur of baking cookies, watching movies, and taming toddler madness. I’m sure Spring is right around the corner, but for now we’ll keep searching for our lost gloves, watching the Planes movie on a continuous loop, and checking the news for school closures. Keep warm, friends! 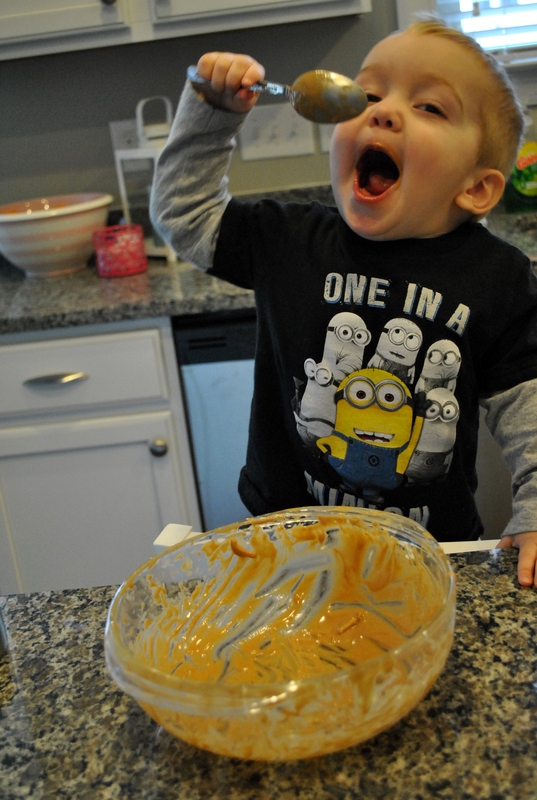 And for goodness sake, if you’ve got some better ideas for entertaining kiddos during the winter, please share them with me! 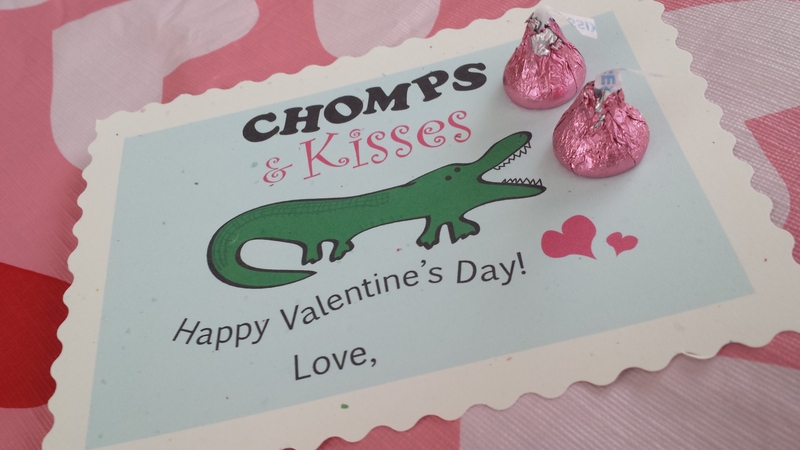 It’s almost Valentine’s Day and we’re totally that family that buys into the whole “Hallmark Holiday” event. Yes, it’s cheesy and you should just show your love all year round, but what’s it hurt to have a little fun and go over the top with mushy stuff every now and then?! 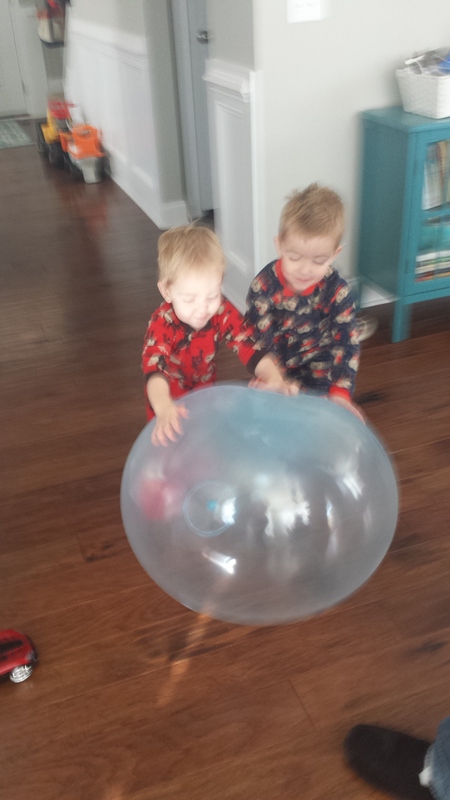 As a mom, I just like having a fun day to look forward to with my little guys. 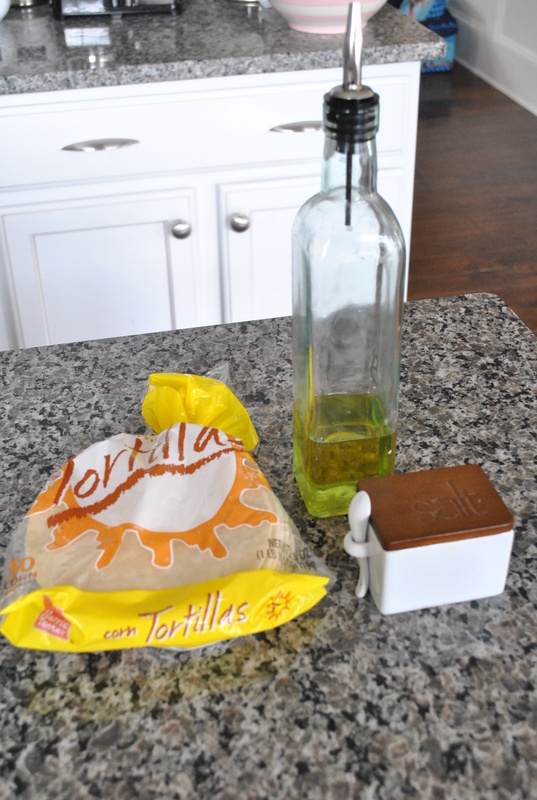 We decorate the house, make fun food, give little gifts. Again, why not?!! 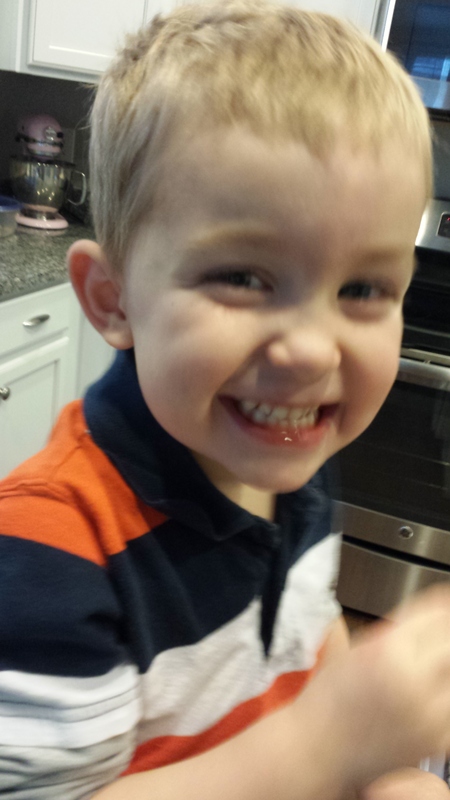 Well who could say no to this little face?! Hmm…the Gator fan in me loved this response. The mom in me was like, “Do they sell those? 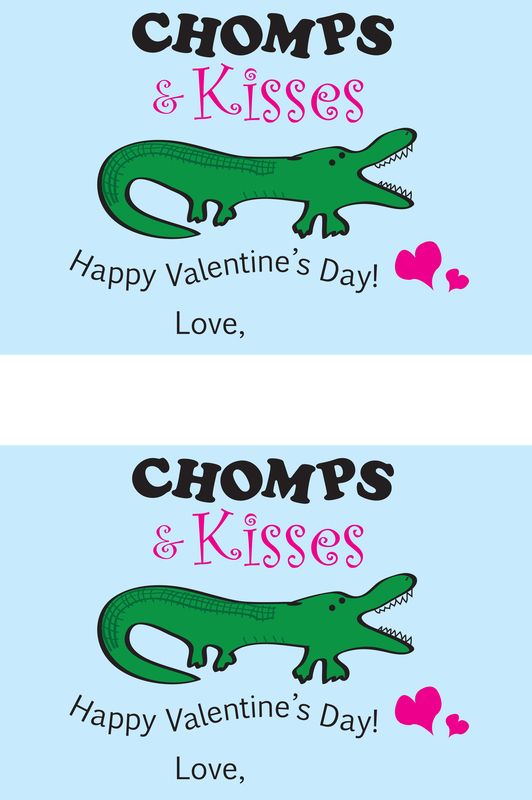 Oh gosh, what is Pinterest going to suggest I spend hours making?” So, to make it easy (on me) I had my handy hubby come up with a quick Alligator card design. 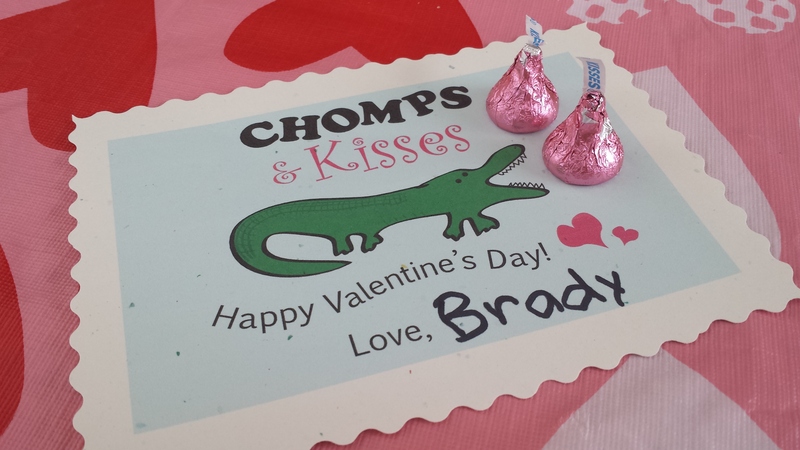 After he designed it (and made all the changes I requested) all I had to do was print, cut them out with “fancy” scissors, and glue some Hershey Kisses on them. I helped Brady write his name on them, and we were done! 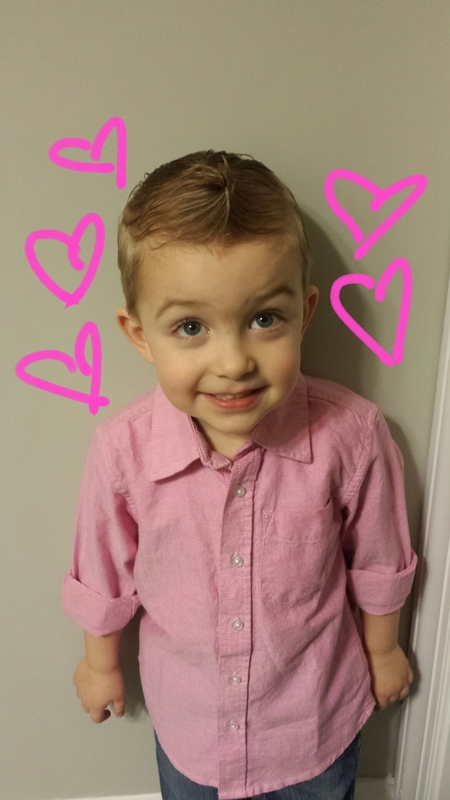 I thought I’d share what we came up with in case anyone needs a last minute, quick Valentine for their little one. Just click on the link below the image. There are 2 cards per sheet. 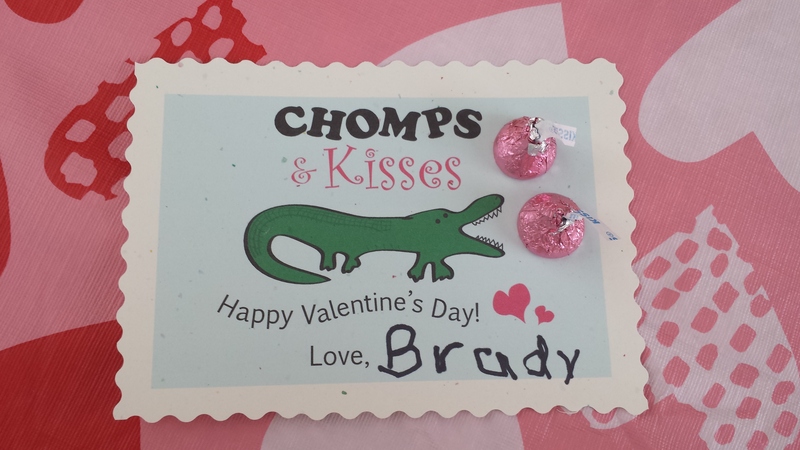 Just write your little one’s name on the card, throw some Kisses on it, and you’re good to go. Take that, Pinterest! Happy Valentine’s Day! Feel free to go over the top and make it a cheesy and memorable day with your loved ones! Happy National Pizza Day! With love being in the air and all (Valentine’s Day right around the corner!) 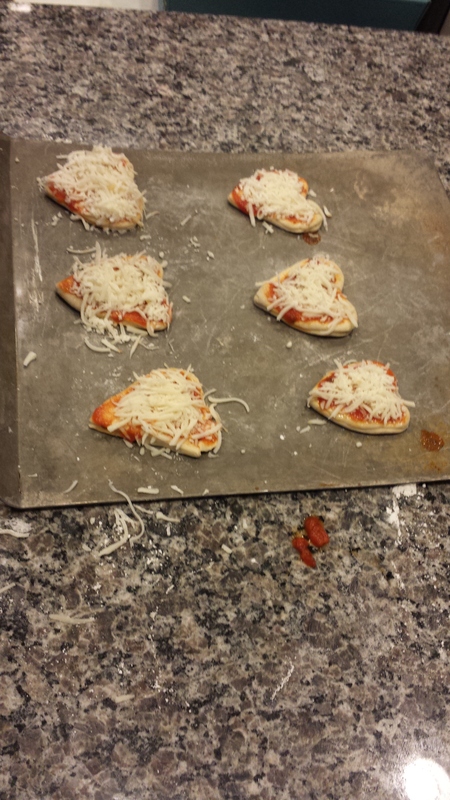 we decided to make heart shaped pizzas today. 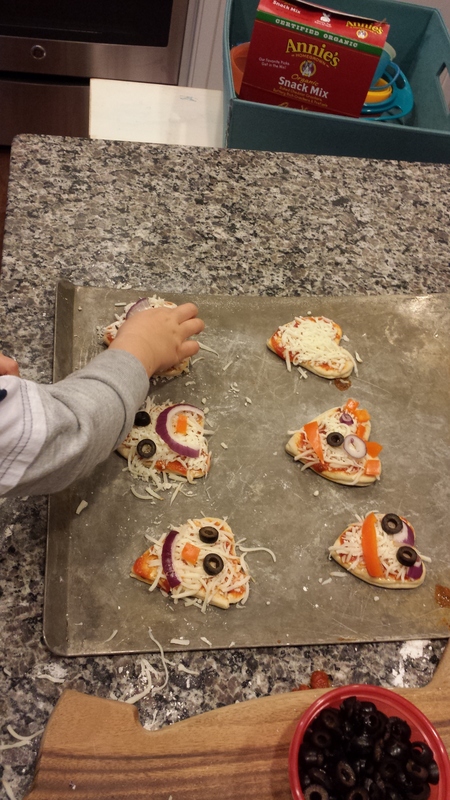 Recently I read a study that talked about how much pizza the average kid eats and how bad it is for them. 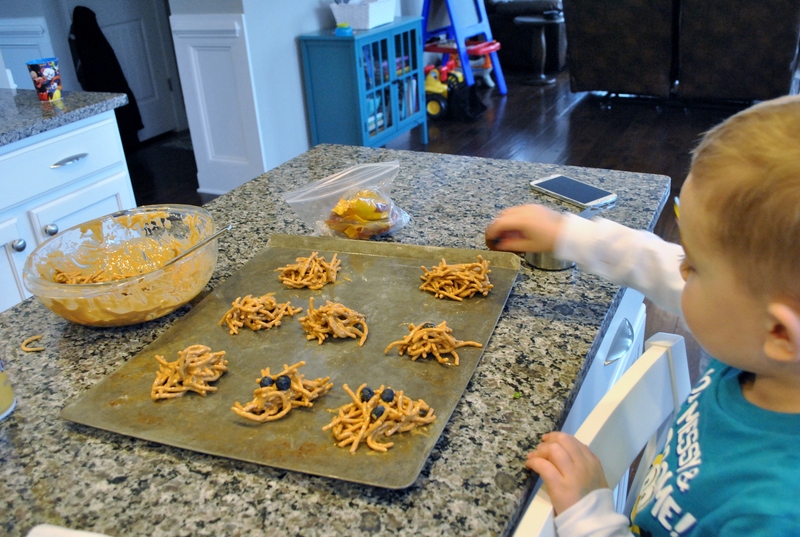 **Insert guilty mom face** Depending on what kind you eat, it can be high in fat, sodium, and empty carbs. 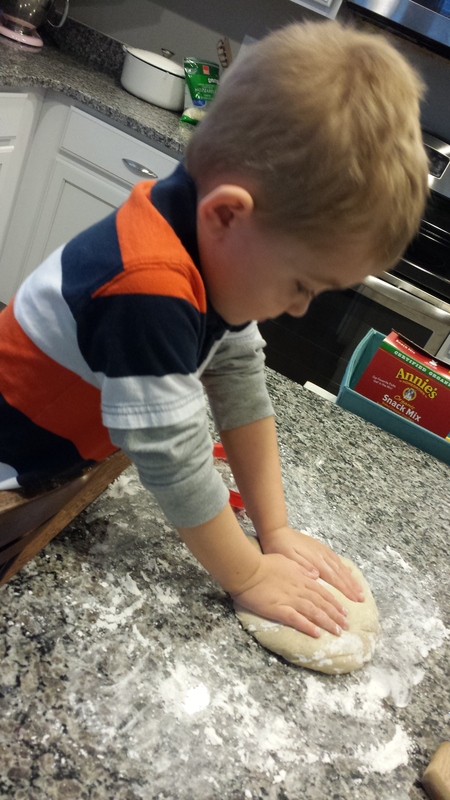 No, we do not eat pizza all the time (maybe once or twice a month) but we do enjoy it around here- especially Nolan. Plus, it’s just so darn easy to order and have delivered! Well, even though I still stand by delivery pizza as an every once in a while treat, it’s always nice if you can “healthify” something you enjoy by making it at home now and then. 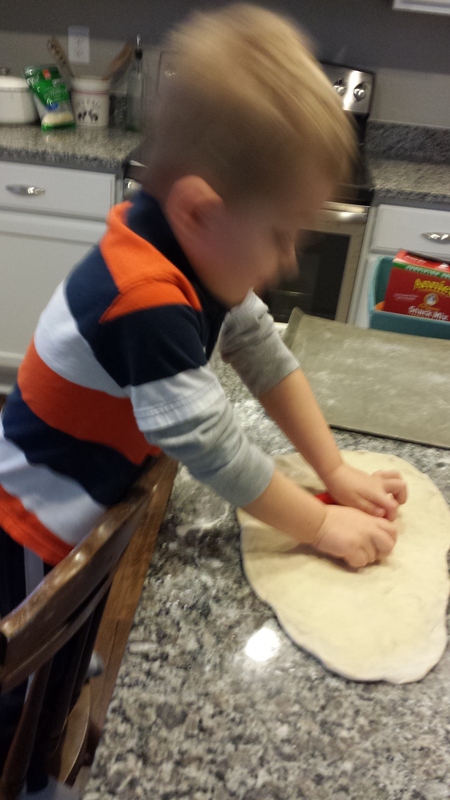 We rolled out our dough on our counter top that we (washed) and dusted with flour. 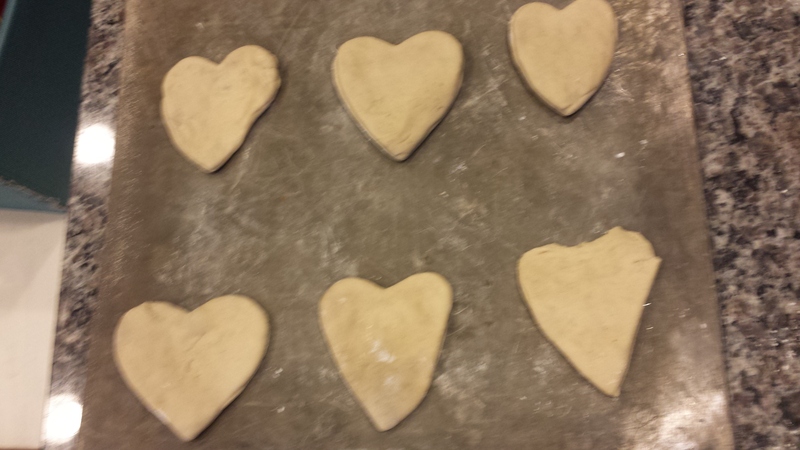 Once we pressed the dough out flat, we began to cut out our heart shape with a cookie cutter. 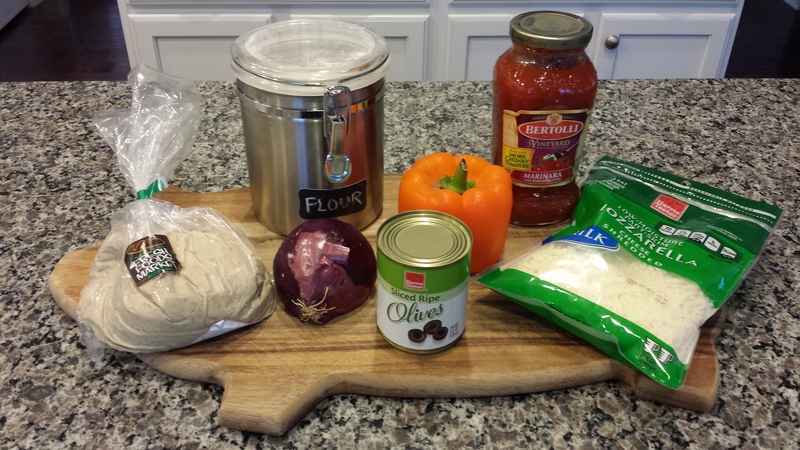 We topped our pizzas with our favorite jarred marinara sauce and low-fat mozzarella cheese. 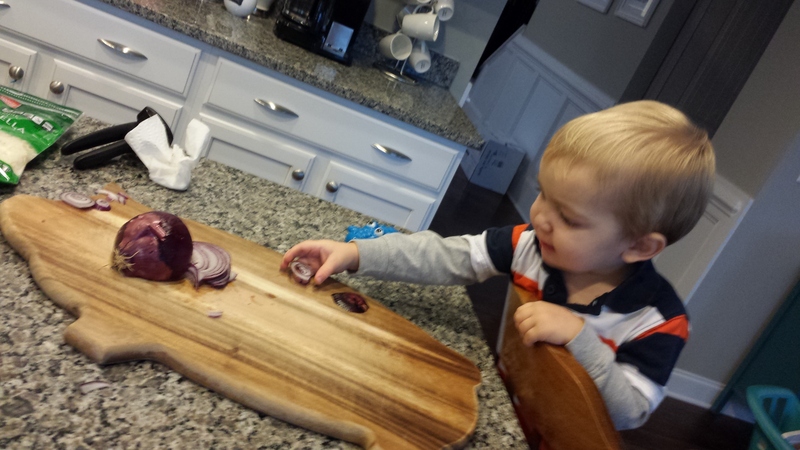 Brady picked his favorite veggies to top the pizzas. 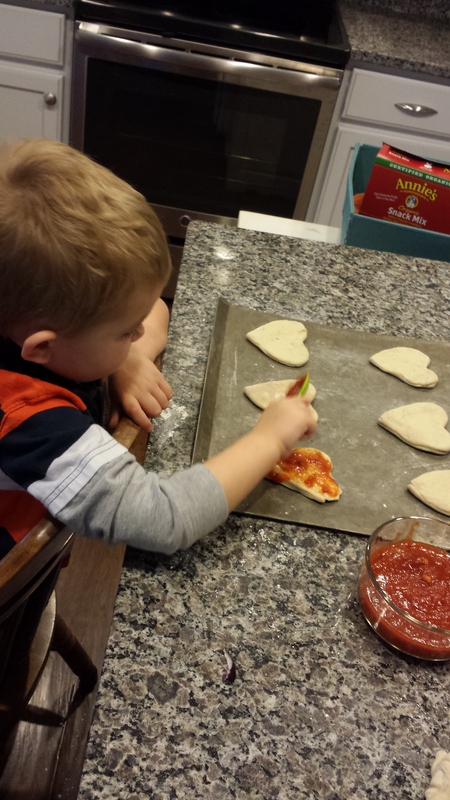 (I tried to get him to pick a red pepper for a pretty Valentine Day color, but he insisted on orange.) 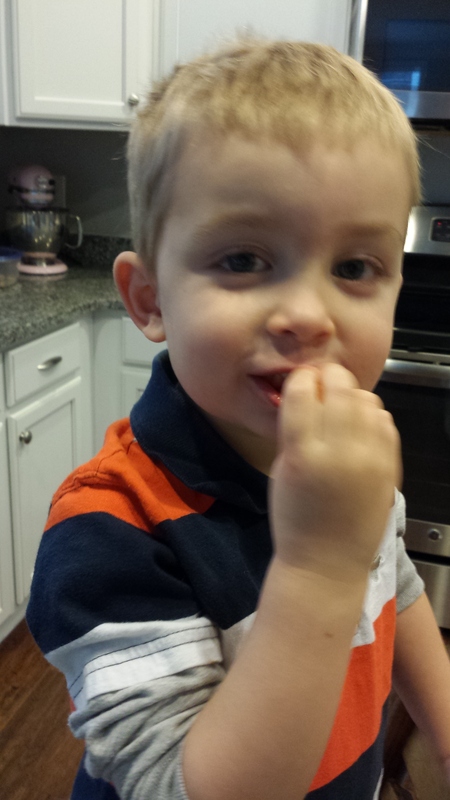 Here he is munching on his veggies! 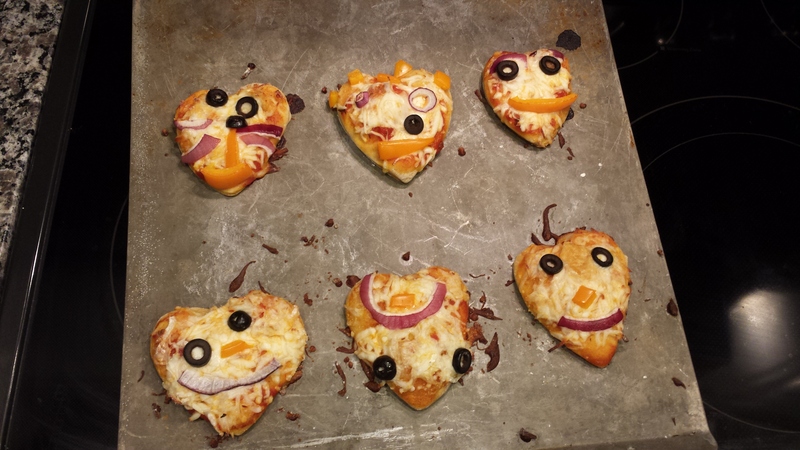 We chopped them into shapes that we could use for making happy faces on our hearts. Then we decorated our happy hearts! We baked our hearts for about 10 minutes at 400 degrees. 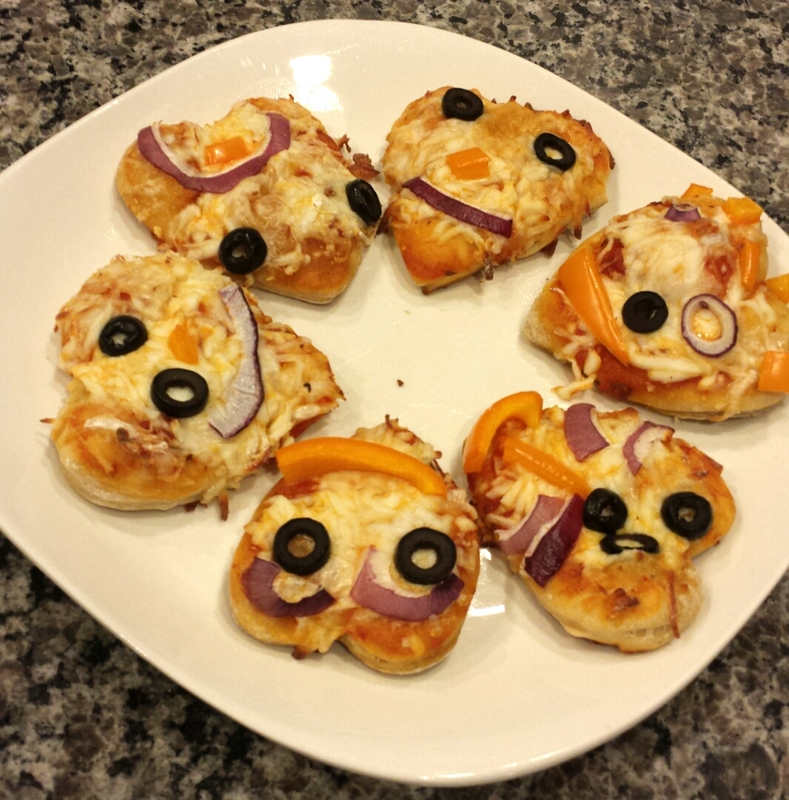 These came out so cute and definitely satisfied a pizza craving for my boys. 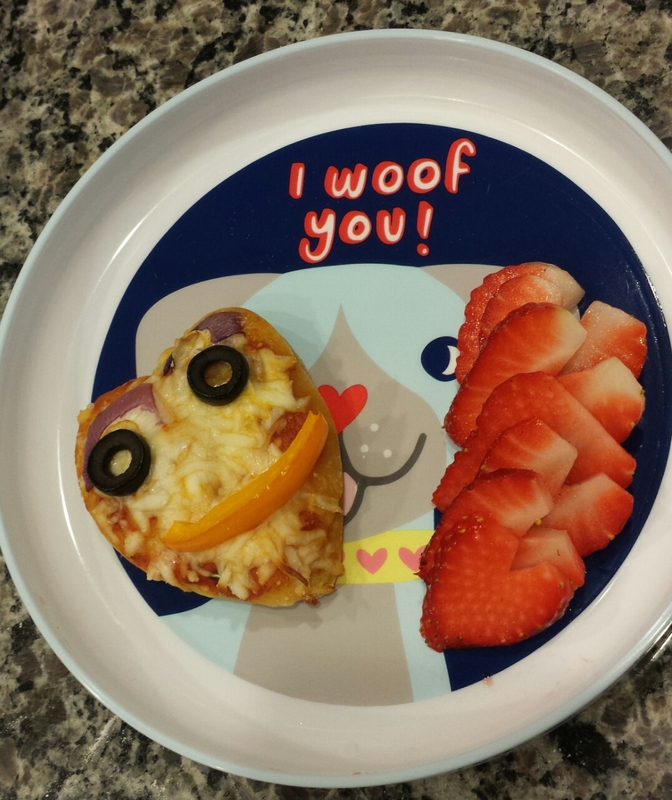 It was a fun way to kick off Valentines Day or just an overall love of pizza. Happy National Pizza Day! And Happy Valentine’s Day! 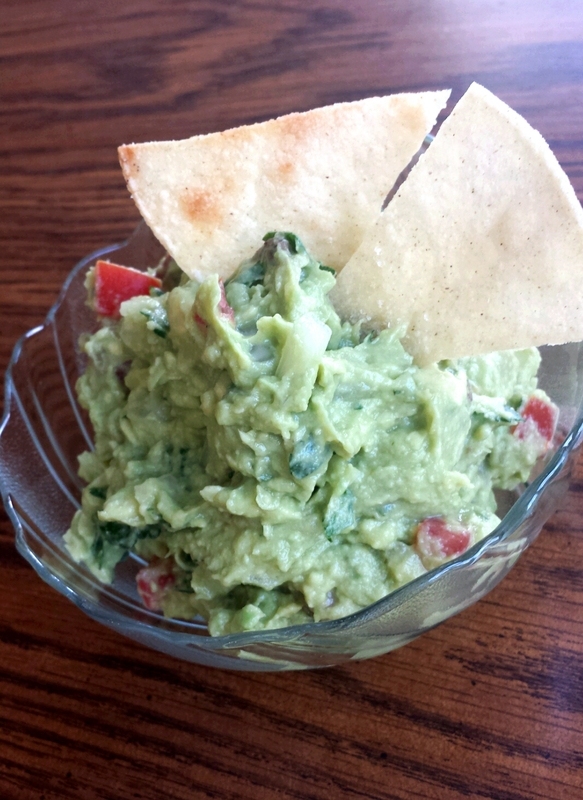 Not only is guacamole delicious, but it’s super easy and fun to make. 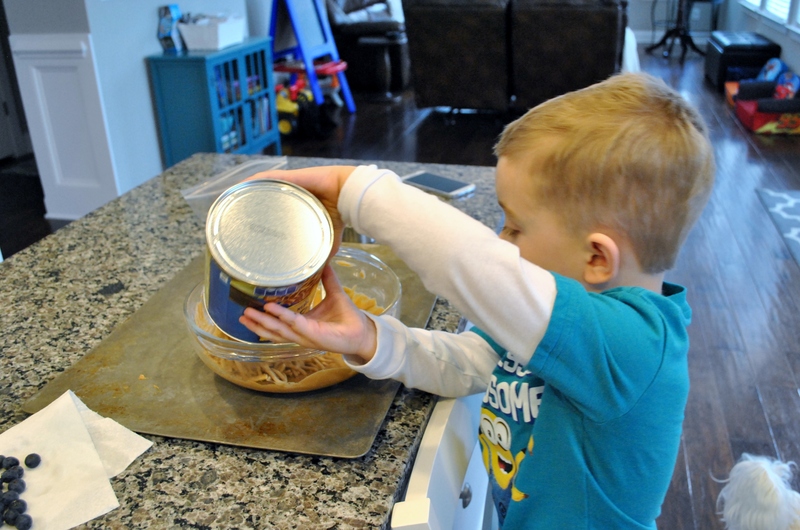 And with these easy to follow instruction sheets, they’re perfect for the littlest of chefs. I have to admit, the teacher in me was really excited about these. 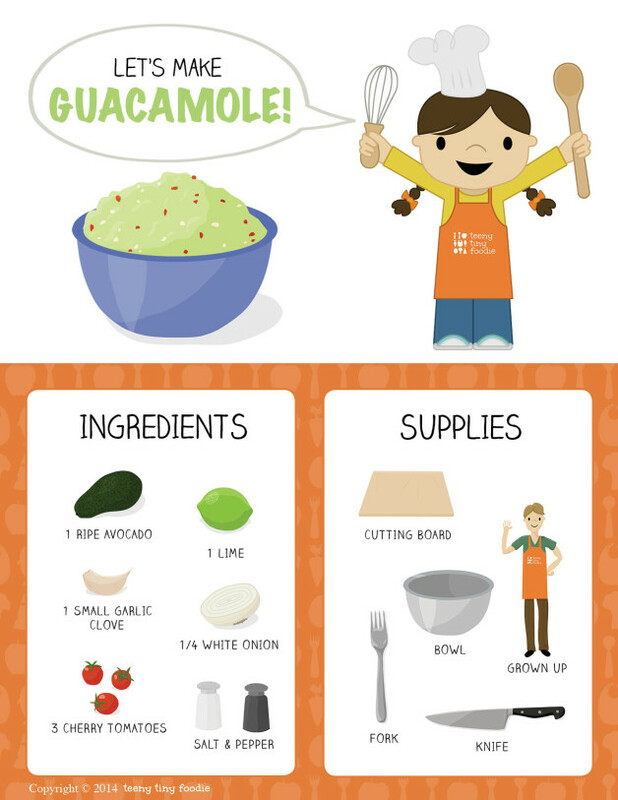 I can definitely see a fun Science or Writing lesson that could happen with these on Cinco de Mayo! 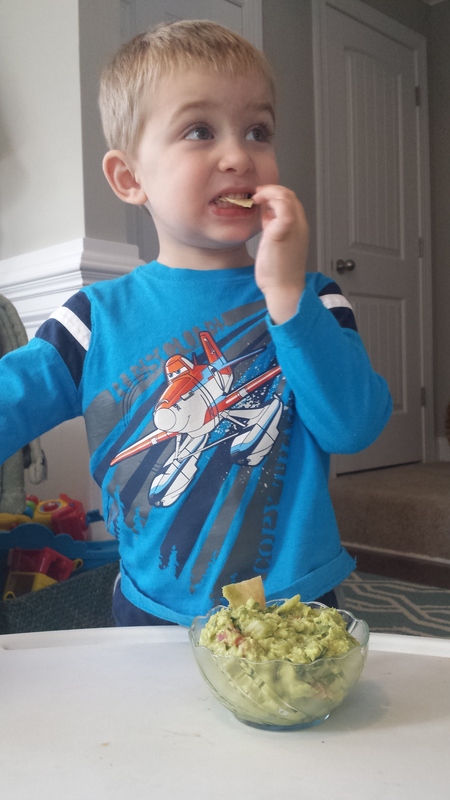 I knew I wanted to try this guacamole recipe with Brady, but we made a bigger batch because, well, Nolan eats a lot. 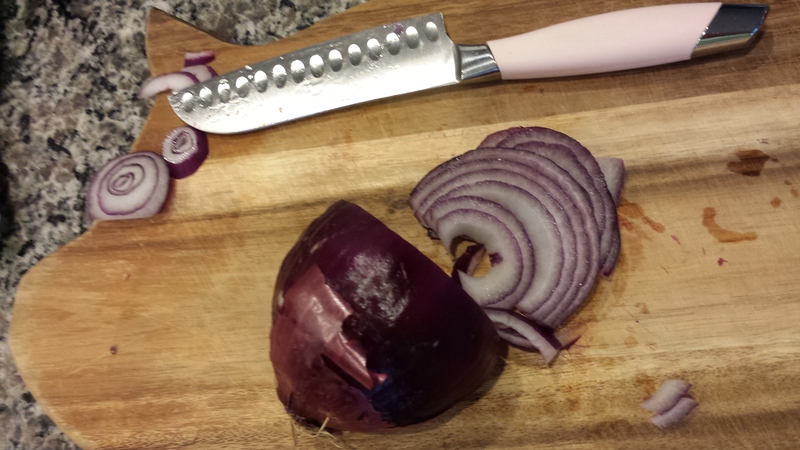 We gathered all our ingredients and got to chopping. 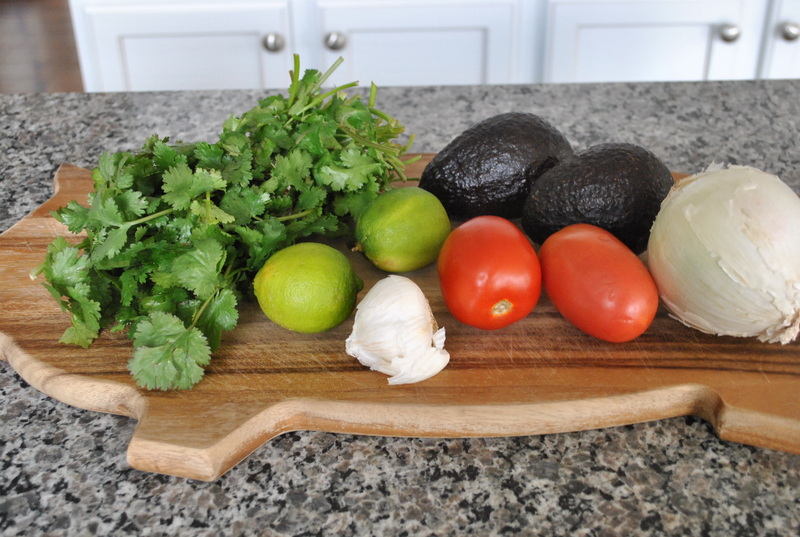 We ended up using 2 avocados, the juice of 1 lime, 1 tomato, a handful of chopped cilantro, 2 cloves of garlic and about 1/3 of a white onion. 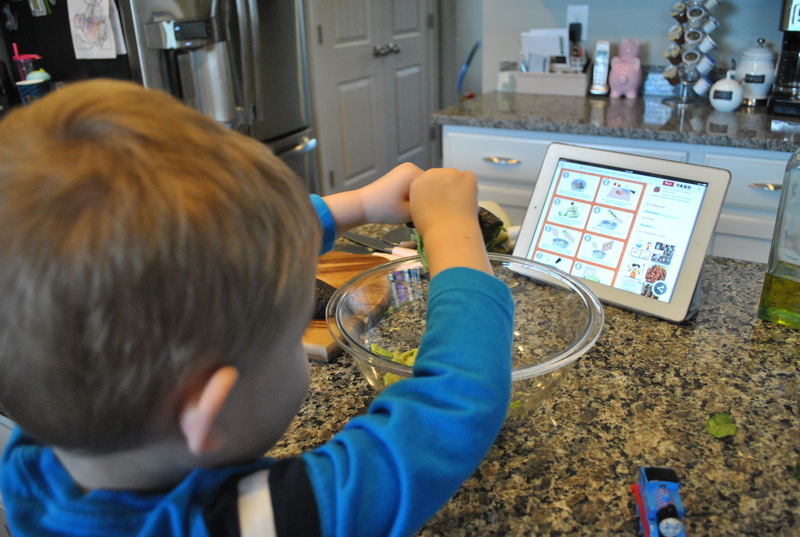 Brady felt so big following the recipe instructions on the I-Pad and his favorite part was definitely squeezing the good stuff out of the avocados! 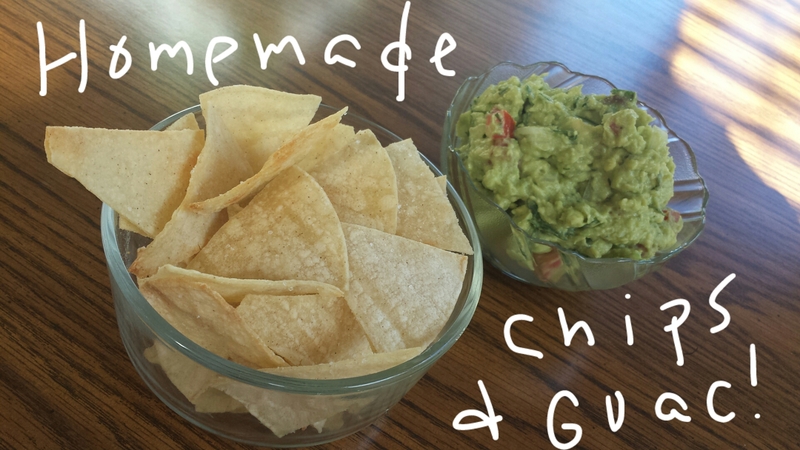 We also made some homemade corn chips today to go with our guacamole. This was fascinating for B. “Wait. Chips don’t always come from a bag? 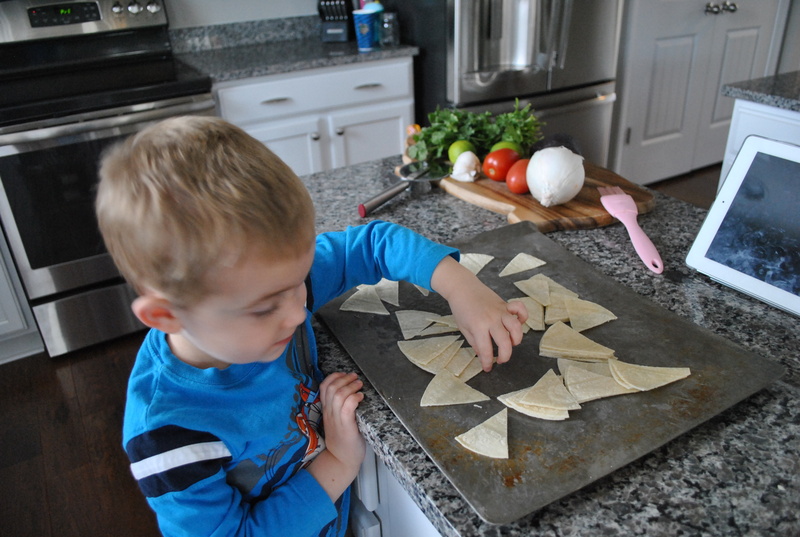 !” Here’s how we made our baked corn chips. 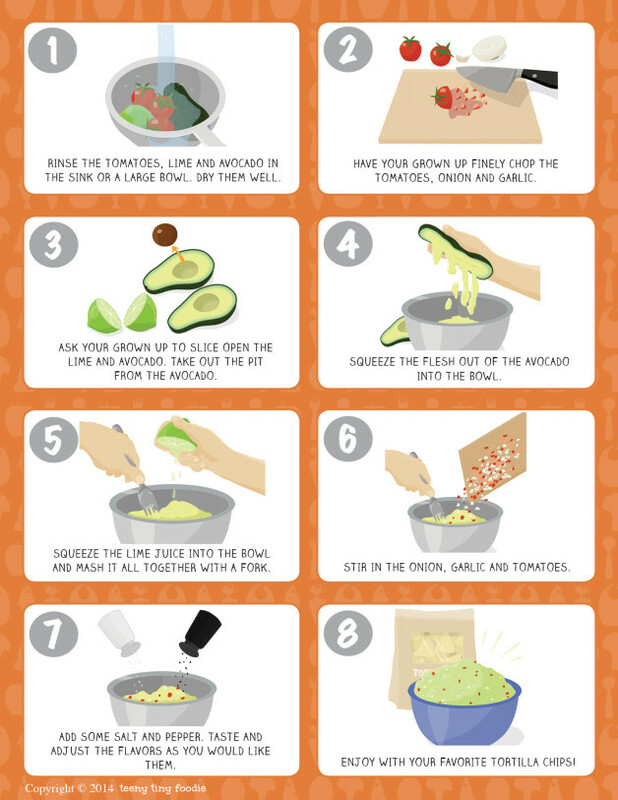 Here’s how we made our baked chips. So much easier than you would think! 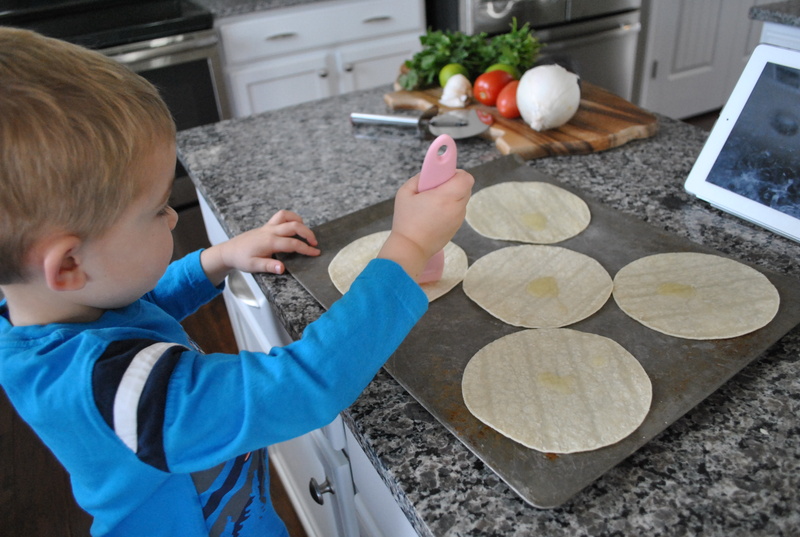 First we brushed each tortilla with a small amount of olive oil on each side. 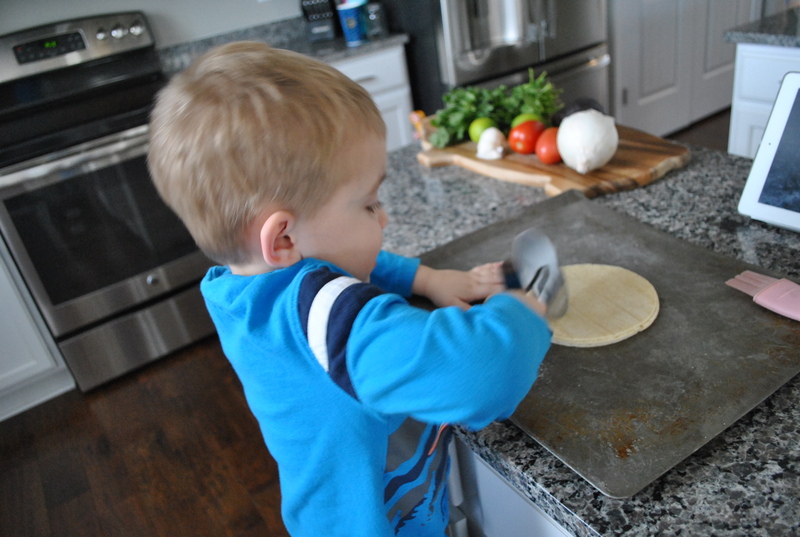 Then we stacked our tortillas (we had 5) and sliced them up with a pizza cutter. 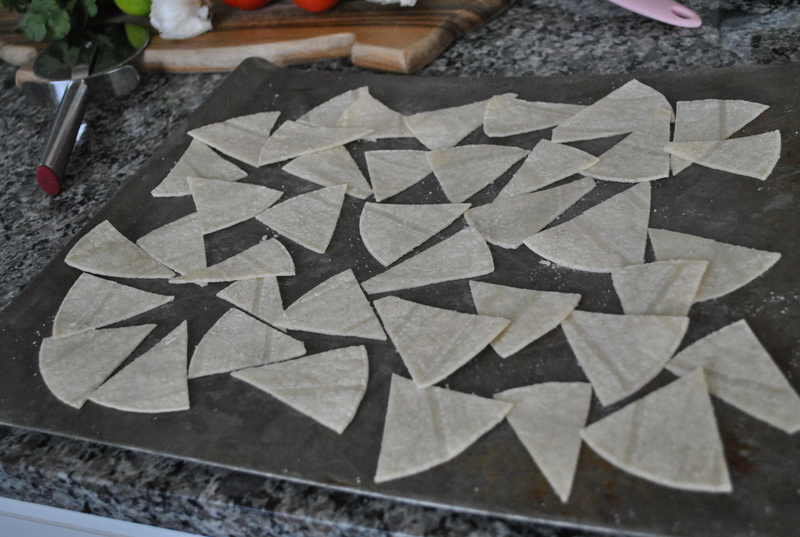 Then we spread the chips out into an even layer on a baking sheet. 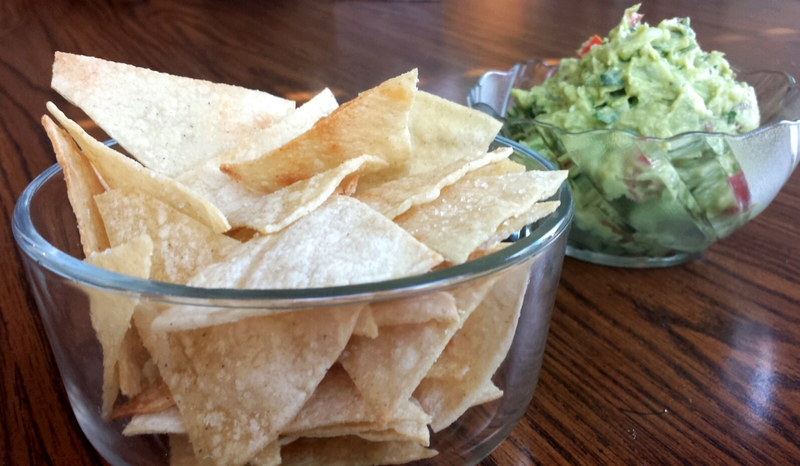 We liberally sprinkled the sea salt on the chips. 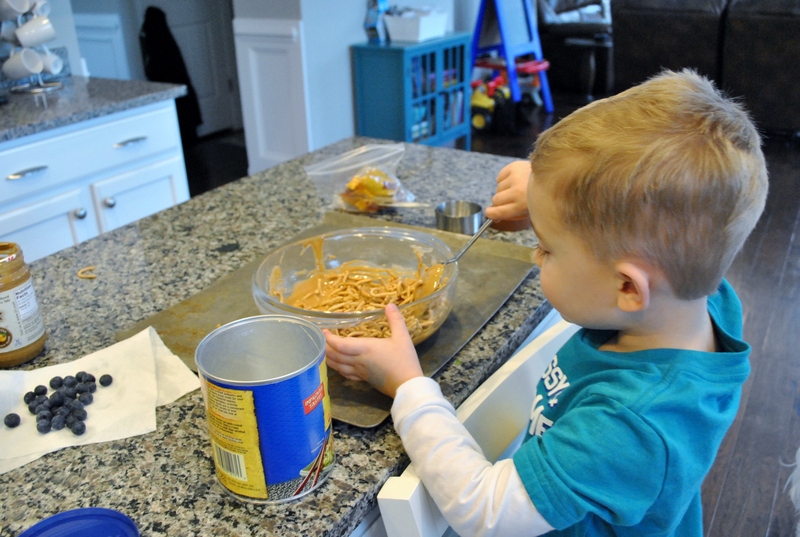 Full disclosure… the chips were a hit, but Brady definitely asked me for a spoon at one point. 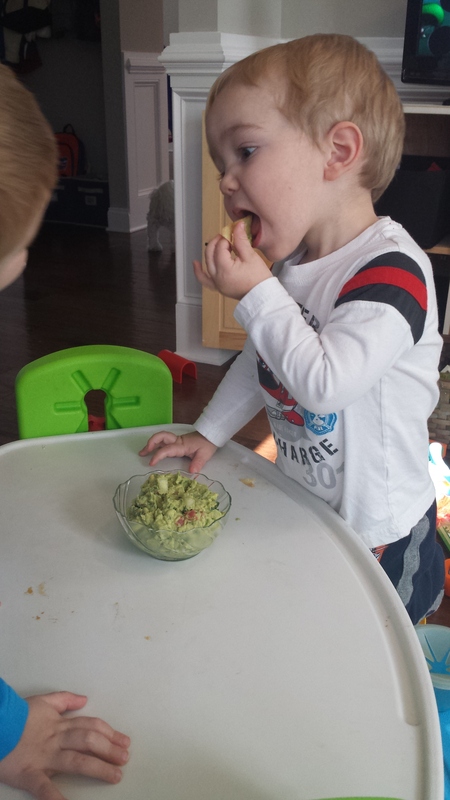 Apparently, it’s now socially acceptable to just eat guacamole straight from the bowl!